Something crazy and exciting happened last week. While getting our usual groceries, I saw the new October issue of Better Homes and Gardens was out. You know, the one with our DIY master bathroom vanity featured in the ‘I Did It’ column? I flipped to the back page and saw our bathroom and faces and I’m sure a huge, goofy grin crossed my face. I resisted the urge to show others in the store. I showed Ev and he said, “That looks like our bathroom. Wait! That’s you and dad!” Cracked me up! I’m not sure about you, but I never fully realized how much time, effort, or equipment went into styling and photographing a room. Stylist Char and photographer Edmund showed up the first afternoon to drop off three bags of cameras and lighting tools. The next morning, Char came in with several bags of styling goodies. Soon after, our master bedroom was full of diffusers, stands, and other things I wouldn’t even begin to know how to use. They had a 10 hour day of work. Staging the accessories. Photographing, then nit-picking over the computer. Tweaking the rug ever so slightly. Changing the way the towel hung. Shifting a bottle a half in to the right. It was so fun to observe. Char and Edmund were awesome to chat with, too. Lots of fun stories to hear from their glamorous lives. After getting all the shots from their list in the master bathroom, the equipment went into the guest room for safe storage. Oh, and we preëmptively took the doors off the hinges because the bathrooms are so small. Edmund said it was a genius idea and made everything easier. Day three in town, the main bathroom got a little attention. Prop rugs, towels, jars, bins, even cotton balls. Here’s a little peek at the first styling round of the shelves. It was a wonderful experience. Something I was so nervous about. I asked Char a million questions about wardrobe options. I’m usually in jeans and a t-shirt or paint covered work clothes, so fashion is far from my strong point. Luckily, Kit, Char and Edmund were excellent at their jobs. We’re so honored to be featured! Thank you so much, BHG! Congrats! I’m so happy for you the bathroom looks great in the pictures you shared! I need to stop in Target tonight and get my hands on a copy, can’t wait to see your smiling face in the mag!! 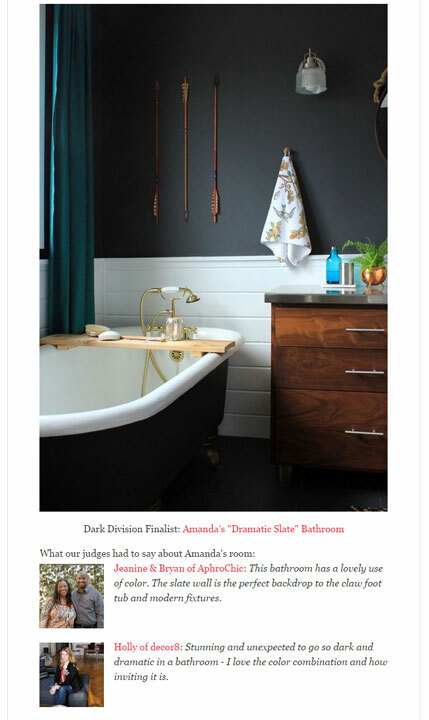 Is your main bathroom being featured in another BHG publication? Thanks lovely! I love seeing your home in HGTV! I’ve openend it up several times, just to look at your beautiful house all over again. I saw that! So excited for you guys!!! Being from Billings myself I love to see a native in one of my favorite magazines!!!! Congrats! How cool! Congratulations. The room is beautiful. Thanks for letting us in on the background fun. Thank you for your sweet comments! I’m always curious what goes on behind the scenes, and for once, I have experienced it. Glad you thought it was fun. Congrats! I love the rug, too! Thanks! I wouldn’t have thought to use a jute rug in the bathroom (for washing), but it is great. And looks awesome, too. So exciting!! Congrats! The room is amazing and that wall color was just the best choice ever! I agree about the wall color. It makes the room, in my opinion. How awesome is THAT?? Congrats! Aren’t they great?!? So fun to work with and amazing at their jobs. Congrats. Well done and well deserved! Thanks so much! It’s a fun surprise. I saw that too! I got my BHG in the mail, and while flipping through, was like, wait…I know that bathroom…the blogger in me was instantly giddy for you guys. Awesome job, and so well deserved. Congratulations!